Some of you may know that I have the skin condition Vitiligo, and that I run a social network for those with Vitiligo called VitiligoFriends.org. There is often significant emotional distress for those with Vitiligo, perhaps going back to it's confusion with leprosy, and maybe even a biological aversion response because of that. 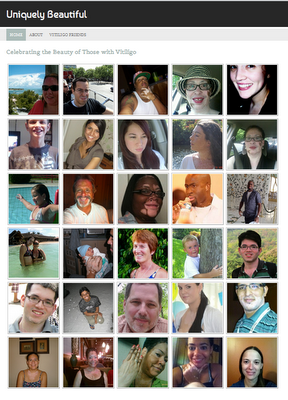 The VitiligoFriends.org network is private (meaning, you can't get past the front page without registering and indicating that you either have Vitiligo or are a friend or loved one of someone who does) because it has our names, some photos, and a lot of conversation that members might not be willing to contribute more publicly. So in honor of World Vitiligo Day on the 25th, I've started a website at http://www.UniquelyBeautiful.net to showcase the unique beauty of those with Vitiligo--both for others to see, and for those of us with Vitiligo to appreciate our own unique beauty. If you have Vitiligo, I encourage you to send a face shot or a photo that has your face in it (without makeup), and I'll add it to our growing wall of beautiful Vitiligo faces. No names, no contact information, no private details, no conversation, just our faces. Someone with Vitiligo coming to this site might feel instantly better about him or herself, knowing the rest of us exist. Someone who doesn't have it would hopefully begin to recognize the diversity and beauty of who we are. You are all beautiful and strong!